Panasonic launches wireless systems, speakers and soundbars for 2017 | What Hi-Fi? Panasonic has lifted the lid on a raft of audio gear, including wireless speakers, hi-fi systems, soundbars and more. Panasonic's product announcements continue. This time it's the turn of audio gear, and there's plenty to wrap you ears around. 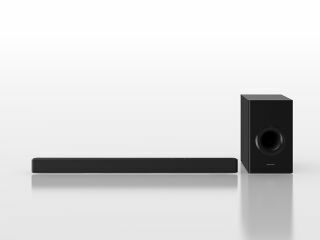 First up, the firm has announced a new soundbar called the SC-HTB488, as well as a soundbar concept it calls the SC-SB1. The SC-HTB488 connects to your subwoofer wirelessly, adding more bass to your home cinema viewing without cluttering the room with wires. It also takes tunes wirelessly from your phone or tablet over Bluetooth. It boasts two independent speakers, offering a combined power output of 200W. The SC-SB1 soundbar concept has a subwoofer built-in, and also takes tunes wirelessly over Bluetooth. It also has an HDMI connection with 4K pass-through for hooking it up to a 4K TV and Ultra-HD Blu-ray player. Three speakers give out a total of 40W. In terms of size, it's a little longer than a shoebox, but a lot shorter and narrower. Next up is Panasonic's SC-UA3 hi-fi system. This is a portable unit that's easy to move from room to room thanks to its carry handle, though it's not battery-powered, so you will need a mains socket nearby. It lets you listen to music from the radio, via a Bluetooth device, over USB or from CD. In terms of power output, we're looking at 300W. Panasonic also announced two new CD hi-fi systems: the SC-PMX152 and the SC-PMX82. The former is Panasonic's first to include the new CD Hi-Res Re-Master function - this aims to up-convert CDs in an effort to mimic high-resolution audio. There's also MP3 Re-Master for upscaling lower quality audio files. Both systems also boast Bluetooth Re-Master, which does the same for any audio source you stream over Bluetooth. Finally, Panasonic's HC1020. This wireless speaker comes with a range of different fabic covers so you can - hopefully - find one to match your room. The idea is to integrate it better into your home. It has 40W of power output, and takes tunes over Wi-Fi, Bluetooth, CD, USB or radio. We're waiting to hear about prices and release dates for all of these products, so stay tuned for more.